100 NIGHTMARES – COVER REVEAL! 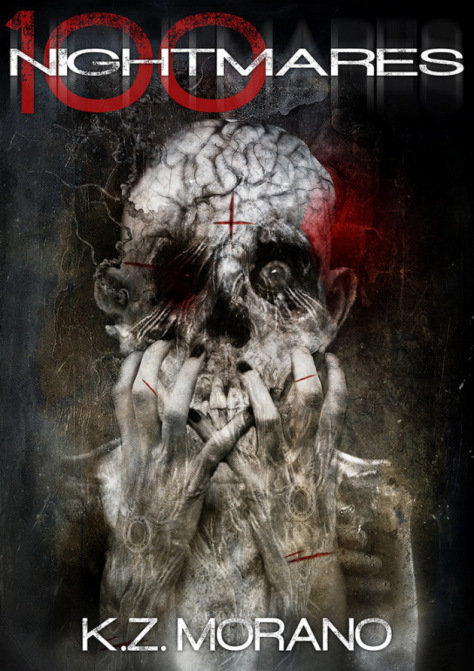 100 NIGHTMARES by K.Z. Morano is a collection of horror stories written in exactly 100 words and accompanied by a few illustrations. It takes a brief encounter with death to cause enduring nightmares. One well-placed word could haunt you forever. Sometimes it goes for the jugular, killing you in seconds. Its silver tongue touches your throat and warm blood hisses before you can scream. Sometimes, the knife makes micro-cuts in the sensitive sheath of your sanity, creating wounds that will fester throughout eternity. Take my 100 words daily like a slow-acting poison or read them all and die of overdose. It’s your suicide after all. K.Z. Morano is an eclectic eccentric… a writer, a beach bum and a chocolate addict who writes anything from romance and erotica to horror, fantasy, sci-fi and bizarro fiction. Over the past few months, her stories have appeared in various anthologies, magazines and online venues. where she posts short fiction and photographs weekly. I love horror stories. Must be why the nightmares are scared of me. LOL! as the stories are short – 100 words – so it can be read and put down without losing the intensity. KZ is a terrific writer. Thanks for the kind words for her book. It sounds like a great read even if not my kind of read!